A lot happened in 1963. Martin Luther King had a dream, Lee Harvey Oswald and Jack Ruby played with guns, Alfred Hitchcock made a film about birds, Sean Connery was oh-so-cool Bond, Ronnie Biggs stopped a train, some Liverpool lads pleaded to be pleased, and Porsche unveiled a new sports car badged ‘901’. Meanwhile, in a Bristol hospital a baby with the surname Raby breathed his first, somewhat premature, breaths. Yes, that was me, and I guess I would have been walking and talking (well, after a fashion) by the time that the car I’m now driving arrived in the UK. You see, this 1965 car was the fifth right-hand-drive 911 (as the production version was named) to be built. It’s the closest I’m likely to get to a 911 of my age and, quite frankly, I’m overawed by the experience. Let’s put it in perspective. 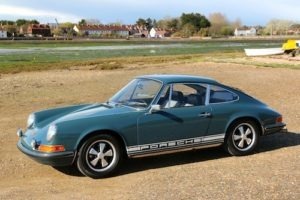 Not only was this car new when I was still in nappies and Bob Dylan was causing a furore at the Newport Folk Festival and beyond by picking up an electric guitar, the Porsche 911 hadn’t become a household name. Schoolboys didn’t dream of owning one and it wasn’t a symbol of success. In short, the 911 wasn’t yet a legend. Imagine that. But those lucky enough to have driven those first examples of the 911 must have realised that Porsche was onto something special, even if they couldn’t predict that the car would become an instantly recognisable icon the world over. And schoolboys must have jumped with glee when they first saw this exotic new foreigner racing along roads populated by Hillman Minxes and Morris Minors. The beautifully maintained example that I’m temporary custodian of came to England on 15th August 1965, and was proudly displayed in the Isleworth showroom of Porsche Cars Great Britain. The gleaming grey car sent out a message to a country still recovering from the austerity of war that Porsche was setting its sights firmly on the future. Being a display model, it was not actually registered for road use until 16th March 1966, when it was given the distinctive number plate ‘LGK 6D’. Today it is surely the nearest thing to being transported back in time to the early 1960s, when acid was still nothing more sinister than something in your car battery, and Aids was a product to help you lose weight. As I drive over the deserted North York Moors on this wonderful spring day, I really do feel as if I have gone back in time. Back to, what I’m told, were simpler days, when male/female roles were well defined (men worked, women cooked…) and the 70mph motorway speed limit was just coming into force. Everything about this car smacks of the early sixties. From the non-metallic Slate Grey paintwork (which actually looks much better in the flesh than in photographs) and chrome trim, to those red Leatherette seats which you sit on rather than in. And, oh, that wonderful classic-car aroma which takes me back to childhood trips in the family Standard Vanguard. No doubt, though, this is a much more accomplished machine than that long-dead Vanguard. I don’t so much grip the huge steering wheel (its rim is too narrow and dainty for that), as cradle it in my palms. Its 400mm diameter (how many Brits would have understood that measurement back then?) wooden rim gives the whole experience a loosely nautical feel, helped no doubt by the vagueness of the steering. I swing the wheel rhythmically from side to side in a flowing motion as I constantly correct for the car’s distinct wandering tendencies on this windy day. It brings to mind Sean Connery in those old Bond movies, navigating his Aston along back-projected alpine passes. The Yorkshire roads may not be quite as challenging, but at least they’re real, not cellulose. And it’s an absolute hoot driving this old 911 over them. Oh, and drive is the operative word here. This is a car that really demands my input. Seeing a bend coming up, I slow down (but not too much), aim the prominent front wings (which will be familiar to anyone with a pre-1996 911) at the start of the curve, lean myself and the colossal steering wheel into the bend and accelerate smartly as the car follows through. Get it right and it’s an immensely satisfying experience; the dainty 165mm-wide tyres struggling to maintain their relationship with the Tarmac. Get it wrong and, at best, I have to wrestle with the wheel to coax the car through the bend. At worst – as some of the first 911 owners found out to their expense – the weight of that flat-six behind the back wheels will pirouette the car gracefully into the heather. Happily, though, I spare the classic such an undignified fate. And to be fair, I’d have to pushing it some to lose control on a dry road such as this. To drivers used to the cart-sprung suspension that was typical in cars of the early 1960s, the surefooted – if rather challenging – handling of this independently sprung 911 must have been a revelation. Think back to other sports cars of the day and you’ll get the picture. Think MGB, Austin Healey 3000 and – if you’re American – Chevrolet Corvette. Not cars that were particularly renowned for their handling prowess. And back in those days, good handling wasn’t at the expense of ride. The tyres are what can only be called high-profile, and no doubt contribute some way to the car’s almost limousine-like comfort. The tyres and torsion-bar suspension just soak up the bumps on these country roads in a way that would be the envy of today’s sports car chassis engineers. No doubt the compliant ride has helped to ensure that this old car is as free of squeaks and rattles as the day it was built. It has a remarkable solidity which is a credit to those Stuttgart engineers who lovingly bolted the thing together all those years ago. But what about that engine hanging out the back? It’s an air-cooled flat-six, of course, just like every 911 after it, until modern noise regulations forced Porsche reluctantly to pour water into the cooling system of the 996-model cars. Open the engine-bay cover and any 911 owner will immediately recognise what’s beneath it. 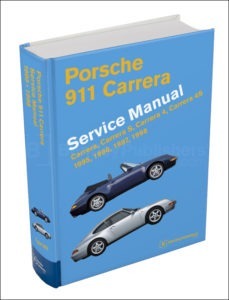 That massive cooling fan – with an alternator inside and air-ducting shroud around – is pure 911, as are the two banks of horizontally opposed cylinders. Less familiar, perhaps, are the two rows of triple Solex downdraught carburettors joined by a massive throttle linkage bar. These, by the way, proved troublesome and hard to tune, and were quickly replaced by altogether better Weber items in 1966. In fact, it’s a rare treat to see one of these early cars with the original carbs still intact. The engine – which was newly developed for the 911 – has a capacity of just two litres (1991cc to be precise) and kicks out 130bhp. No, don’t scoff; in 1965 this was a respectable figure that compared favourably with those of other sports cars. And remember that this car weighs just 1080kg; by comparison a 2003 911 Carrera is over 300kg heavier. But let’s not kid ourselves here. This is not a fast car by today’s standards. Back in 1965, however, it was considered quite nippy. Claimed performance figures showed a 0-60mph time of 8.5 seconds and a top speed of 131mph. Not bad from a mere two litres. It would, I’m sure, have been a struggle for those early road-testers to achieve such figures, mind you. I’m finding that to get any sort of performance from the Solex-equipped engine demands that I keep the revs up (max power hits at a heady 6100rpm) otherwise it feels positively gutless (that’s one reason many owners retrofitted Webers). Keeping within what is obviously a narrow power band forces me to master that somewhat vague type-901 gearbox. It’s a dogleg layout (which was de rigueur for serious sports cars) with first gear back and to the left. Which in itself is fine, but the other ratios are positioned rather too close to each other and it’s embarrassingly easy to select the wrong gear. Second and reverse, in particular, are worryingly intimate with each other. On the plus side, however, five forward gears – all with synchromesh, don’t you know – would have been quite a novelty in 1965. It doesn’t take me long to get acclimatised, though, and I’m soon flicking – no, make that stirring – through the gears with aplomb. What I’m not getting, however, is that trademark 911 wail at high revs. That didn’t come along until the larger 2.2-litre engine with revised intake and exhaust manifolding arrived in 1970. Shame – without it the 911 experience seems incomplete. To be frank, the engine note is quite unremarkable. But then in 1965 drivers would have known no better, and I force myself to remember that as I blast over a stunning landscape that hasn’t changed during the life of the 911. I concentrate on my more immediate environment, though, and note that the dash – with its trademark five dials – is undeniably 911. The tachometer is in the centre, of course, while the speedometer reads up to an optimistic 150mph (which would surely have impressed those becapped schoolboys as they pressed their noses to the window; ‘Golly Jennings, she’s faster than father’s Bentley’). The oil level, oil pressure, oil temperature and fuel gauges are just where any air-cooled 911 owner would expect them, as is the clock. There’s a wonderfully period Blaupunkt Breman radio set (the rather sterile term ‘head-unit’ came much later) offering medium and long wave, the sound coming from a single speaker on the dash top. Ideal for listening to Radio Caroline, then (‘I can’t get no satisfaction, ’cause I try and I try and I try and I try. I can’t get no…’). Those Porsche aficionados who say that there’s no place for wood in a 911 will have to think again. Not only is the steering wheel wood-rimmed, there’s also a long strip of trees across the full width of the dash. And it looks just right for the period, especially with the chromed ‘911’ badge on the glovebox lid. The heating system is crude even by the standards of the day (which is not surprising, Porsche struggled with this right through to the end of the air-cooled days). An unmarked lever in front of the gearstick controls the heat, which is piped in through closable vents in the inner sills – a system which Volkswagen Beetle owners will be familiar with. And here’s a thing – because the amount of heat from an air-cooled engine is somewhat dependent on engine speed, these early 911s came with an auxiliary petrol-fired Eberspächer heater located in the luggage compartment. This intriguing device later became optional before being quietly dropped in 1973. Yes, the idea of a device that’s burning petrol within inches of the fuel tank scares me too! But it’s too warm to need a heater today, so I continue my fantasy of driving back to a simpler age. I spot a lay-by up ahead, and pull over, struggling with the non-assisted steering which becoming surprisingly heavy at low speeds. I jump out to admire the lines of the car, its chrome glinting in the afternoon sun. 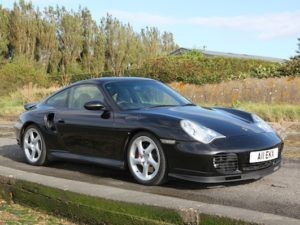 This is pure 911, just as the 28-year-old Ferdinand ‘Butzi’ Porsche had penned it. Devoid of the chunky bumpers, arches and spoilers which adorned later cars, this Porsche looks surprising petite on its narrow 4.5-inch wheels. It’s a pretty car with none of the machismo of later 911s. Whether that’s good or bad depends entirely on your point of view. To my mind, the delicateness of this car makes it a completely different animal to later, more brutal, 911s, and therefore beyond comparison. As I climb back into the aromatic cockpit, I realise that, in just a short time, I’ve grown to like this little car a lot. Not only because it’s a Porsche, but because it has that indefinable quality called character. Something which classic-car enthusiasts enthuse about but is often nothing more than an excuse for, well, an old car. But this 911 really does ooze character. Getting in it and driving off feels comfortable, reassuring and intimate. It’s a friendly car with no pretensions. With these thoughts in mind, I draw up alongside my own transport of the moment – a Boxster – which looks large, futuristic and most certainly macho. I bid my new friend farewell, push the remote locking button of the Boxster and drop into its airbag-protected, climate-controlled, computer-designed ergonomic cockpit. The soft interior lamps dim gently as I turn the key and the water-cooled, fuel-injected, Motronic-controlled, environmentally clean engine whirrs smoothly into life. The ABS, PSM, SRS and a myriad of other lights in the dash extinguish to tell me that all is well with the car’s microprocessor systems, and the dulcet 21st-century dance tones of Massive Attack pour from the car’s many speakers. I marvel at just how far Porsches (not to mention popular music) have come in 40 years. But then I grasp the gearlever, slip it into first (remembering that it’s forward and to the left) and think again. Most cars still have this somewhat archaic device for allowing you to select an appropriate gear ratio. Something that perhaps should (and indeed can) be left to electronics. All have a steering wheel mechanically linked to the front wheels with which to direct the car. The majority still have an internal combustion engine. All are capable of causing death and serious injury. Have we really come so very far in the intervening years? It would seem that car manufacturers are somewhat cautious in the ways they embrace new technology. Yes, modern Porsches are packed full of gadgetry, but go beneath that and the basics are unchanged. Why don’t we have, for instance, full drive-by-wire with joystick steering and electronically (rather than hydraulically) actuated brakes? The technology is out there now. Maybe it’s because we drivers wouldn’t accept it. After all, that’s why manual transmissions have persisted; because sports car drivers demand it. It’s a case of giving the customers what they want. But do we really know what we want? After all, no one knew they wanted a translucent blue, one-piece computer until Apple revealed the original iMac. But it went on to be a best-seller and a design classic. Perhaps, then, it’s time that manufacturers took more risks and gave us cars that we hadn’t even dreamed we wanted. Brilliant article. I love how you portrayed just how involving it is to drive a very early Porsche 911. Think I will have to stop by your workshop soon and have a look if ok? All the best, Shaun. Thank you, Shaun! You’d be very welcome to visit – just get in touch in advance to ensure I’m here.